Good news from both East and West Africa for our staff and partners! Augustine N-Yokun, Program Officer in our Ghana country office has been awarded a full scholarship to a prestigious leadership development course offered by the West Africa Civil Society Institute (WACSI) to participate in the Civil Society Leadership Institute (CSLI) Programme. Noting Augustine’s “strengths and your motivation to participate in the programme,” WACSI offered full funding to participate in the training, which is “designed to strengthen the operational capabilities and professionalism of [civil society organization] actors so they can better influence policy processes and groom the next generation of leaders in West Africa.” The training will be held in Accra, Ghana in March, 2015. Augustine N-Yokun at work in the Ghana office. 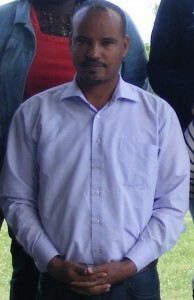 Yeshitila Alemu, Program Officer in Ethiopia, has similarly applied for and been granted a scholarship to further his professional development and technical expertise. In conjunction with St. Francis Xavier University in Nova Scotia and the world-renowned Coady International Institute, Yeshitila has been offered full funding to participate in training on microfinance at the Institute. The Community-Based Microfinance for Financial Inclusion course will take place in Addis Ababa, Ethiopia, in March 2015. This training is the same one that Executive Director Byabasaija Abdallah of CEDO, one of CFTC’s local partners in Uganda, attended in 2013 thanks to an application for funding supported by a CFTC recommendation. Yeshitila Alemu, Program Officer, Ethiopia. The Coady International Institute has also awarded Mulu Haile Tesema, Executive Director of CFTC’s long-time Ethiopian partner MCDP, a partial scholarship to attend Community Development Leadership by Women to be held at St. Francis Xavier University in Halifax, N.S. CFTC will support Mulu to visit Canada for the training as part of our capacity-building commitment to our local partners. Special congratulations to Mulu, as well, for the well-deserved recognition she received recently from the Ethiopian government, being named one of 2014’s Most Influential Women, Country and Regional Winner in the NGO sector. Her achievements are a source of pride and inspiration to all of us at CFTC. 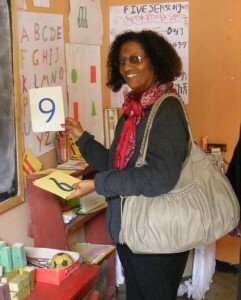 Mulu Haile visits an MCDP-supported Early Childhood Education Centre. CFTC has made a serious commitment to staff and local partner capacity building, both in terms of technical expertise and general organizational and leadership development. We believe building strength from within is key to delivering impact in the field for the children and families we support with your assistance. We are confident that the recognition and reward of scholarships from these prestigious and influential organizations will be well-placed to help us further our vision and mission to make a difference in the lives of children.